I saw the other day that a new version of Swedish had been released so I downloaded it and had a read. It is very hard to get a view on it without some context so I thought I'd compare it to a known benchmark. In this case I chose the 2014 ETC Army Restrictions as my point of reference. The aim with the ETC comp is to get the strongest possible army within the agreed restrictions. Yes, you need to be aware that ETC is primarily aimed at a team competition while Swedish is for singles play but at least some context. As you can see there is very wide variation - far more than I expected. It reinforces the general view that Dark Elves had very light comp on them at the ETC. However try to run an ETC list in Swedish and you get murdered. The Dwarfs look like they got harshly treated at the ETC - and that may be because of the role that they play in teams' competition - but are treated very leniently in the Swedish environment. What is really interesting is the breadth of variation that exists between what I'd guess are the two primary European comp systems. If both are aimed at balancing the game I would expect more common ground. Rule differences e.g. line of sight interpretation may explain some of variation but I don't think it adequately explains the spread we are seeing. Can't offer much more than that - as we already knew - this ain't an exact science. That is interesting Pete, when TVR was going to come to Guardon he put his dwarf list through Swedish and I was amazed it came out so high on the scale. I personally see the comp systems aiming to do different things. ETC is super serious cutting edge warhammer at it's finest, while Swedish to me forces unusual choices and encourages a different approach ie variety. Yes forcing variation is just "moving the goalposts"...but for Cancon in January I'm seriously looking hard at a Sea Guard themed High Elf list. In ETC/FOB/"normal" warhammer this sort of list gets butchered. 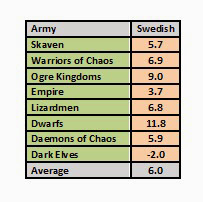 BUT in Swedish, it gets a nice midrange comp score (comp hit from Dreadfleet fluff approved Stardragon and RBT's), and is (oddly) competitive (on paper). The fact that a double carnosaur list a) appeared at a competitive event, and b) did rather well alongside the appearance of a pure Slaanesh DoC list at the recent Swedish event in Auckland proves the point. I don't think you can discount the fact that ETC comp is aimed at its team environment, so bringing each army to more or less the same level is not really as important. You might be able to field a harder Dark Elf list than Dwarf, but each team can only do that once, so it's not that big a deal. I think they're mainly focused on trying to knock off the worst elements and combinations that would be seen in every list for that race and that would give them a significant advantage. Swedish tries to curb excesses in every direction, and hits you hard any time you try to slant a list with lots of flyers, very large units, etc. You might get a bit of everything, but going too far on anything that might be seen as powerful gets you a big comp slap. I'd be interested to know if Swedish comp is generally used in a W/D/L system or a 20-0 sort of thing. Because Dwarfs have trouble pressing for big wins, and that may be reflected in their lighter scoring in individual events (as opposed to their role as a draw-machine at the ETC). Hoodling: The official Swedish points-packs at least used to be very specific that they were intended for 20/0, all battleline tournaments, didn't they? Has that changed? I don't know, it was a question. Last I checked, the Swedish pack was pretty loose in terms of how to apply it. It just gave a mechanism for scoring various lists, and it was then up to you on how you used those scores. There may have been a few sample suggestions.